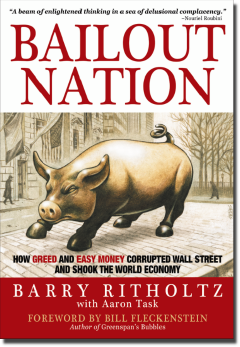 This is the second book on the global econo-financial meltdown I have read, and is much larger in scope than the first one I read (The Looting of America, Amazon.com review). A related one is The Future of Hedge Fund Investing: A Regulatory and Structural Solution for a Fallen Industry (Wiley Finance) (my review post, and Amazon.com review). What is depressing is the realization that taxpayer funded bailouts have been happening for decades. Each bailout only makes things worse, and sets the stage for a larger bailout down the road. Companies and industries lobby for these bailouts, get them, and yet find themselves out of business a decade or two later, despite the bailouts. The Federal Reserve, ever expanding its mandate and powers, personified and led by the blind pursuit of an intellectual belief in the self-correcting powers of the market by Alan Greenspan, has probably done more damage to the US economy than any other single player or institution. Politicians, US Presidents, and the Congress, Democrats and Republicans alike, have allowed themselves to be corrupted by the banking lobby. Treasury Secretaries have been like the proverbial wolves set to protect the sheep from the wolves. And this is without getting to the banks, the traders, the investment firms... Everyone has been relentless in their pillage of the taxpayer. The bailout numbers are huge. They start out relatively modest, in the low hundreds of millions of dollars, with the bailout of Lockheed Aircraft Corporation in 1971, then with the Chrysler bailout, and by the time we reach the end of the last decade, they are flowing like a torrent, gushing hundreds of billions of dollars, to all and sundry. Numbers so large they dwarf the cost of the Second World War, of the rebuilding of Europe, of the New Deal. Not only the amounts, but also the frequency is mind-boggling. A cash injection of $45 billion dollars and guarantees of $306 billion to the Bank of America. A $700 billion TARP program. The takeover of AIG - $173 billion. $249 billion in guarantees to Citi. And on and on. Barry Ritholtz takes his pen to the crisis and paints a rogues' gallery of players, all with their noses to the trough. Take the SEC, which holds primary responsibility for enforcing the federal securities laws and regulating the securities industry, the nation's stock and options exchanges, and other electronic securities markets. How in heaven's name can you expect effective regulation when the head of the SEC believes in less regulation, or is on record having advised companies to destroy evidence??!! What about the Treasury Secretaries - Hank Paulson under George Bush, and Tim Geithner under Barack Obama; they are all cut from the same cloth. The less said about the Congress the better. Maybe Mark Twain said it first, and said it best. With the World Trade Center smoldering in ruins, the Fed sat around and waited. Wednesday, Thursday, Friday - nothing. It wasn’t until right before the markets reopened - when it would matter most to asset prices - that it finally did something. On September 17, 2001, almost one week after the attack, and precisely one hour before markets reopened, the Fed slashed rates another half point. For a person who believed in the markets' ability to "self-regulate", Fed chairman Alan Greenspan's repeated interventions to bailout markets and companies is astounding. Just how deeply in bed (if that is indeed the right phrase) are politicians with corrupt industry can be gauged from these excerpts. The Glass-Steagall Act of 1933 not only established the Federal Deposit Insurance Coporation (FDIC) but also established separation between commercial banking and the securities industry. This Act was repealed in 1999 through the Financial Services Modernization Act, and set the stage for the rampant speculation by banks. Enron paid Dr. Gramm between $915,000 and $1.85 million in salary, attendance fees, stock option sales, and dividends from 1993 to 2001. Days before her attorneys informed Enron in December 1998 that Wendy Gramm’s control of Enron stock might pose a conflict of interest with her husband’s work, she sold $276,912 worth of Enron stock." ... Senator Phil Gramm ... was the senator behind the Commodity Futures Modernization Act of 2000 (CFMA), and spearheaded the repeal of Glass-Steagall. Thomas Jefferson, the principal author of the Declaration of Independence, argued that since the Constitution did not specifically empower Congress to create a central bank, doing so would be unconstitutional. Much has been written about sub-prime mortgages that were bundled into mortgage backed securities and sold off, re-packaged and sliced-and-diced and re-sold. How could near-junk instruments like CDOs be rated AAA. And how could government debt also be rated AAA at the same time? Especially if there was a massive difference in returns between the two. Higher returns imply higher risk. Higher risk has to result in a lower rating. Because higher risk essentially means a higher probability of default. So why the identical ratings??? It turns out that the three ratings agencies - Standard & Poor, Fitch, and Moodys - were rating these instruments. At the same time they were also helping create and package these instruments. Like a student who not only sets the question paper, and then writes it, but also gets to grade his own paper. Conflict of interest? You bet! What serves as a chilling reminder of the law of unintended consequences and of the hubris that attends possibly accidental success is articulated in Chapter 12 - "Strange Connections, Unintended Consequences". The 1996 Telecommunications Reform Act eliminated media ownership regulations, resulted in Clear Chanel Communications owning 1200 channels nationwide, getting rewarded with a stock price of $70 and a $40 billion market cap. "now it trades for pennies. ... an under $1 billion market cap." Why??? It fired its local talent, replacing their programming with "... a homogenized playlist feed from a central bunker in Texas"
The root cause - the root of the greed, the craziness, the mad dash to leverage, all of it - according to Ritholtz, was the result of "dot-com stock option p*nis envy". Yes. Not the first rush of technology driven billionaires like Oracle, Microsoft, EMC, Intel, Cisco, Dell, etc... Not even the second rush in the 1990s - Netscape, Yahoo!, RIM, etc... It was the dot-com boom where nerdy students with nothing more than gluttonous greed in their eyes and a paper-napkin thin business plans becoming paper millionaires that drove Wall Street bankers crazy. With envy. With greed. With a sense of an intellectual inferiority complex. Hence the rise of the quants on Wall Street. The problem was that banks are not the same as technology startups. When a tech start-up fails, the cost is minimal. A few million dollars at the most. Not so with banks. Add to that the hundreds of millions of dollars in bonuses that executives paid themselves. This is true of industries beyond Wall Street though. Some solutions are suggested towards the end of the book. Some are practical, some too idealistic; but at the end of the day, almost every one of those suggestions is better than keeping the status quo. And unfortunately, the status quo is what has actually been preserved. A free lunch to the pillagers of the American economy, fully paid-for by the taxpayer. This is a suggestion that is going to be anathema to both sides of the political spectrum, for various reasons. This is less than one-fourth of the money pumped into one single entity - AIG!!! This amount is less than 5% of the money under the TARP program! !